We undertake house clearance in all areas of Manchester: Wigan Bolton Bury Rochdale Oldham Salford Tameside Trafford Stockport Cheadle Altrincham Sale Greater Manchester Prestwich. Glass recycling looks set to benefit from a new advertisement campaign aimed at the general public. 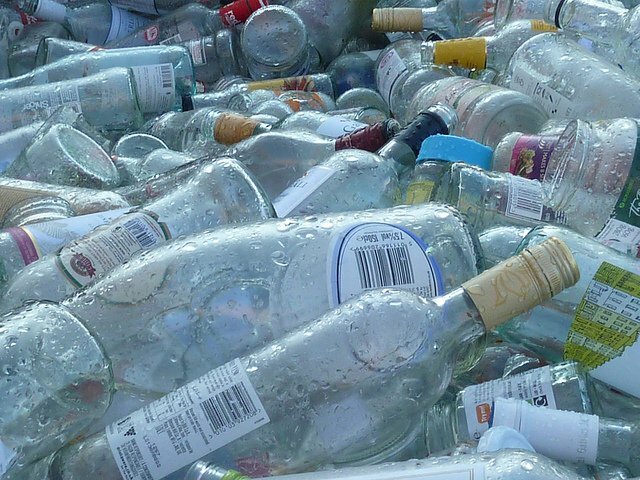 British Glass, the industry body for the Glass Container Industry hopes to increase glass recycling rates in the UK with the new campaign. Details were released to local authority recycling officers and glass contractors at a roadshow just before Christmas, and the audience were advised to gear up for the impact the campaign will have on their domestic waste glass collection. The ads are designed to encourage glass recycling by stressing how easy it is to use bottle banks and are informative about the types of glass packaging that can be recycled. For example they advise consumers that glass jars can be recycled as well as the more typical bottles. The three ads in the campaign (with the slogan: ‘Don’t Bin it; Bank it’) also introduce a new glass recycling logo which replaces the ‘A’ in glass with the recycling triangle.